Having successfully got a reasonable LNWR route out in the form of Black Country LNWR 1920, I have now moved on to my next route. As well as being a LNWR route, this one will also cover a fair amount of LYR territory - got to have somewhere to run Alec's nice LYR wagons ! I have been fascinated by the Huddersfield lines for over 40 years or so - in fact over the years, I have built a 4mm scale 'what if" model of Huddersfield Midland, based on a hypothetical expansion of the MR line to Newtown Yard - in real life, WW1 stopped the MR from building their proposed passenger station, so only a goods branch was actually built. 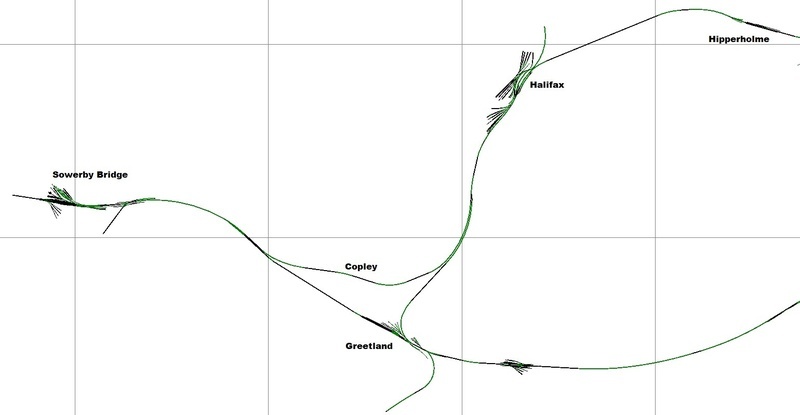 The LNWR Colne Valley main lines from Standedge Tunnels down through Huddersfield to Heaton Lodge Junction, then uses running powers over the LYR lines through Mirfield to Dewsbury Junction where the LNWR Leeds Old Line diverges at Ravensthorpe (line ends just past Ravensthorpe). The LNWR lines also include part of the Leeds New Line from Heckmondwyke Junction to Battyeford (future extensions will take this line to Gomersal Tunnel). Also included is the start of the Kirkburton branch - Deighton is included (future extensions will take this line to Kirkburton). The LYR Calderdale lines from Elland Tunnel through Mirfield to just past Dewsbury Junction. The LYR lines also include the start of the LYR lines to Low Moor through the Spen Valley from Mirfield, the LYR lines to Low Moor through the Bailiff Bridge branch, and the LYR lines from Huddersfield through Springwood Junction tpwards Penistone. The MR Newtown Goods branch from Mirfield to Newtown. Stage 2 - will cover the extension of the LNWR lines to Gomersal Tunnel, and Kirkburton - the extension of the LYR lines from Mirfield to Low Moor via the Spen Valley and the lines from Brighouse through Bailiff Bridge to Low Moor. 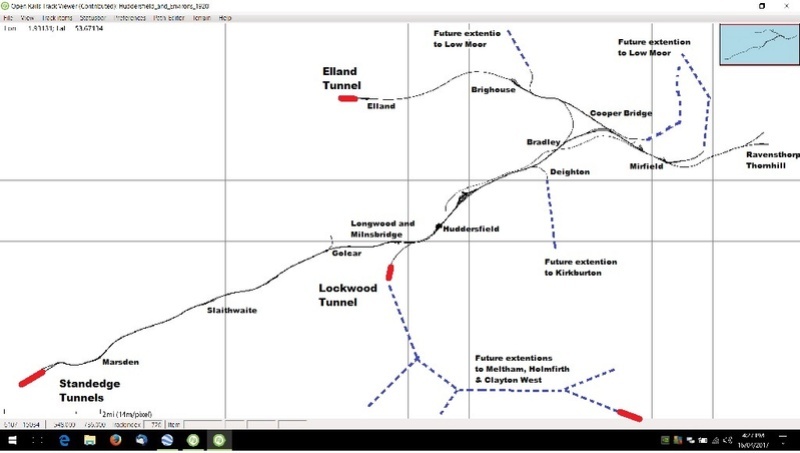 This will also cover the LYR line from Lightcliffe Tunnel through Low Moor to Bowling Tunnel (it is unlikely I will extend through Bowling Tunnel down to Bradford). Stage 3 - will cover the extension of the LYR lines from Huddersfield to the Meltham Branch, the Holmfirth Branch, and Clayton West Branch and part of the line to Penistone, ending in Cumberworth Tunnel. Note that many of the ends of the lines are 'book-ended by tunnels' - a natural place to break the scenery elegantly ! Stage 1 is well under way ! This looks a terrific route and will certainly give us a good run with Alec's coaches and wagons, not forgetting the necessary engines which have also been produced to pull them. I will look forward to your progress reports.
. . . and very nice too! Keep up the excellent work! Here's a screen shot of an LYR Class 27 hauling some coal wagons from east to west on Brian's latest route. A copy has been supplied for comment, etc. 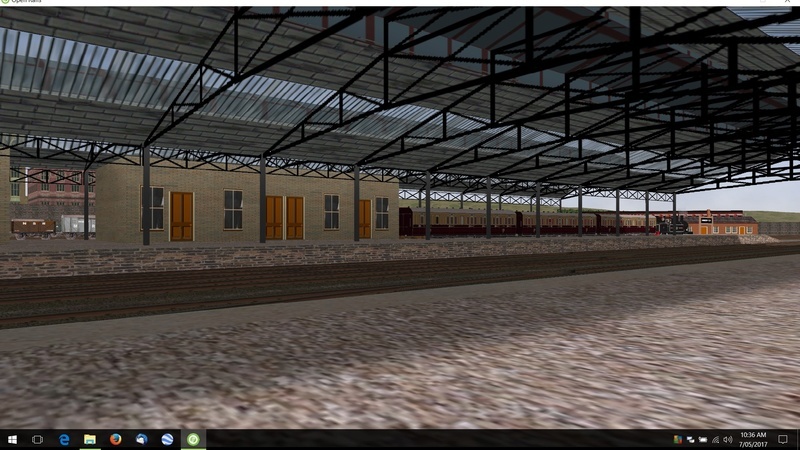 This is looking very good and should provide an excellent location for LYR and LNWR formations. Please keep teasing! Thanks for another pair of good screenshots. The route continues to develop and look very good! Here's screen shot of LYR Class 23 0-6-0ST at the head of a permanent way train - somewhat relevant methinks - including a 15T hand crane from Brian's excellent NSW downloads. The locomotive is one by Dave Robinson. This route is surpassing all expectations as shown by this screen shot from the latest Beta version. A LYR Class 27 crosses the viaduct with a Loco Coal train, and it should be observed that the latest 1920s vehicles can be seen on the road below. The interest in MSTS may not be what it was but so long as Brian et al continue to produce such excellent work there's still hope for we diehards! Once again many thanks Brian, and I only wish that I could devote more time to my own virtual modelling! I don't know if you realise it, or not, but you have actually setup a correct train in the right place, Paddock Viaduct. The LYR sourced an amount of loco coal from the two collieries, Emley Moor and Park Mill, on the Clayton West branch, so loco coal trains from Clayton West to Mirfield shed hauled by LYR 0-6-0's are quite correct ! Just a bit of an update on this route - it hasn't been abandoned ! - I also have a build up of essential repairs and maintenance around the house which I need to address. So, overall, I've been VERY busy these last few months. Hopefully within a couple of weeks, once I get the urgent stuff out of the way, I'll be able to get back and finish off the route. However, I also have a batch of LYR locomotives and a batch of LYR coaches to build and try to get ready for the route's release. So, hang in there - it will be worth the wait !!! You're not wrong about the impact of "life" on MSTS/TSM! Firstly make sure you take good care of your eyes, but I imagine we are all waiting patiently for what should be an excellent route. Just a couple of quick comments about my Huddersfield route to BE AWARE OF. Firstly, I have a tendency to rename and rationalize my Trainset folders - for the basic activities running over the LYR lines, please check the folder names in all Consists that use the existing 4 LYR goods engines (classes 23, 25 and 27), by Dave Robinson and John Riddell - you may have to change the folder name in the consists to match the locomotive's folder name as downloaded. Secondly, Ian Macmillan has kindly built a custom set of Hudderfield PO wagons for the route, I have used these in some Consists, however, you may have to wait a day or two until Ian uploads them to UKTS. Other than that, there should be no other obstacles to having some great running over this new route. ENJOY ! What a great present you are giving us all. Many thanks and we look forward to V2.0! Untold hours of pleasure await. Many, many thanks. Here's a screen shot from one of the included activities. 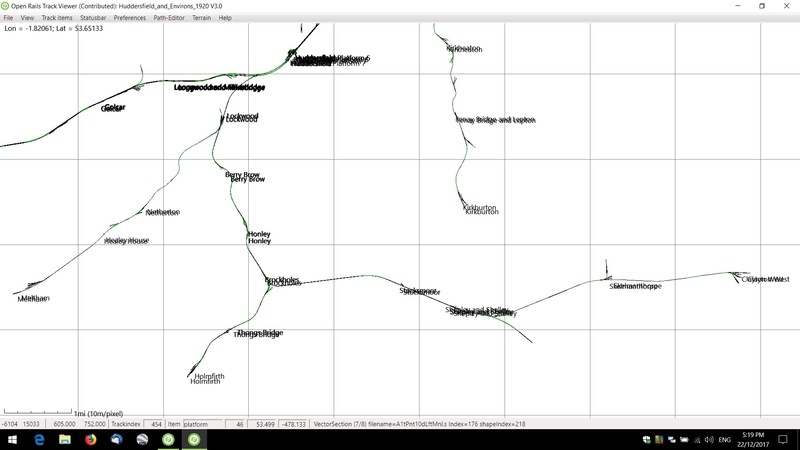 Today I have uploaded the Huddersfield and Environs Version 2 route to the UKTS downloads. Once the mods approve the new file, it should be available for download within the next day or two - Happy Christmas and enjoy ! What an excellent Xmas present for us all, thank you Brian. Your superb work is very much admired and appreciated. 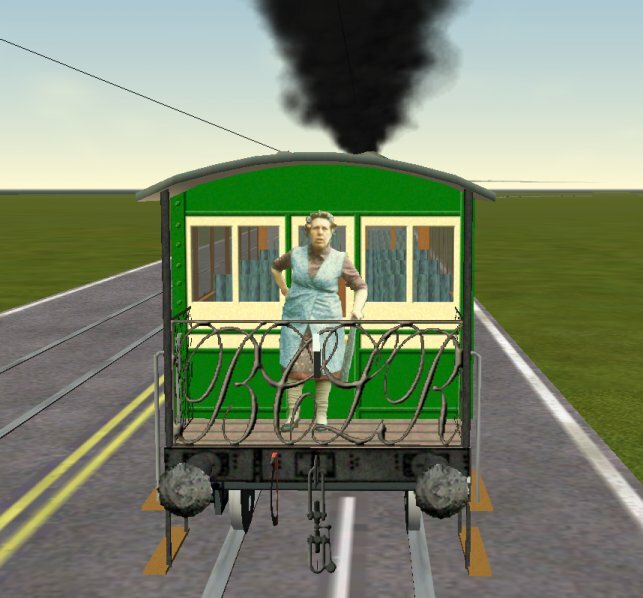 The S - Down Slow Passenger LYR has been deleted from the UKTS Downloads as it is incompatible with Huddersfield and Environs LNWR & LYR 1920 V2. It will shortly be replaced by S - Elland_Thornhill Slow LYR which is being prepared for uploading. Version 3 is now underway !!! Note - the 'road' at the bottom of the valley is just a placeholder for terrain shaping - it will be deleted when the final terrain tweaking is finished. All the track has now been laid for V3 - The Penistone line from Springwood Junction to Cumberworth Tunnel, and the Meltham, Holmfirth and Clayton West branches. You're doing a marvellous job with this route, and hopefully I'll be able to take full advantage of it soon. Just a little teaser to keep you all on your toes ! A Bradford passenger is just leaving Holmfirth. Won't be long, V3 should be available in the not to distant future. Looking good, and not a wrinkled stocking to be seen! Great news Brian, and Ian, is that carriage one of Wesley's creations? A reminder of some great comedy, and I hope to be joining the "old codgers" myself soon. Well, I'm now in a position to make another announcement. V3 left a few 'untidy' ends, so V4 extends down from Low Moor through Bowling Junction to Bradford Exchange - extends from Elland through Greetland, Milner Royd Junction and Sowerby Bridge and ends in the tunnel - extends from Greetland and Milner Royd Junction through Dryclough Junction, Halifax and Hipperholme to rejoin the existing line at Lightcliffe. The Rishworth and Stainland branches are only STUBS and will not be modelled. 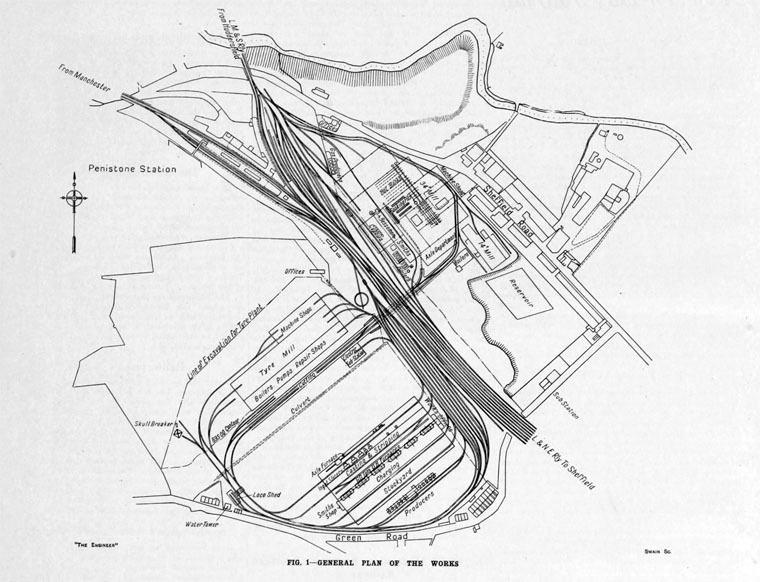 By adding Bradford, trains now have a real place to start and finish rather than in a tunnel, and the Greetland, Sowerby Bridge, Dryclough Junction triangle now balances the Mirfield, Heckmondwyke, Thornhill triangle at the eastern end - and it completes all three routes from Bradford to Huddersfield, via Cleckheaton, via Bailiff Bridge and via Halifax. V4 will be the LAST version, there will NOT be a V5. Release of V4 will be in due course. Brian, you continue to spoil us! Many thanks. The current version is really great, and I look forward to the "final" version. We really are being spoiled. Can I be very greedy and suggest that the Penistone line be extended as far as Penistone station to give a natural terminus? 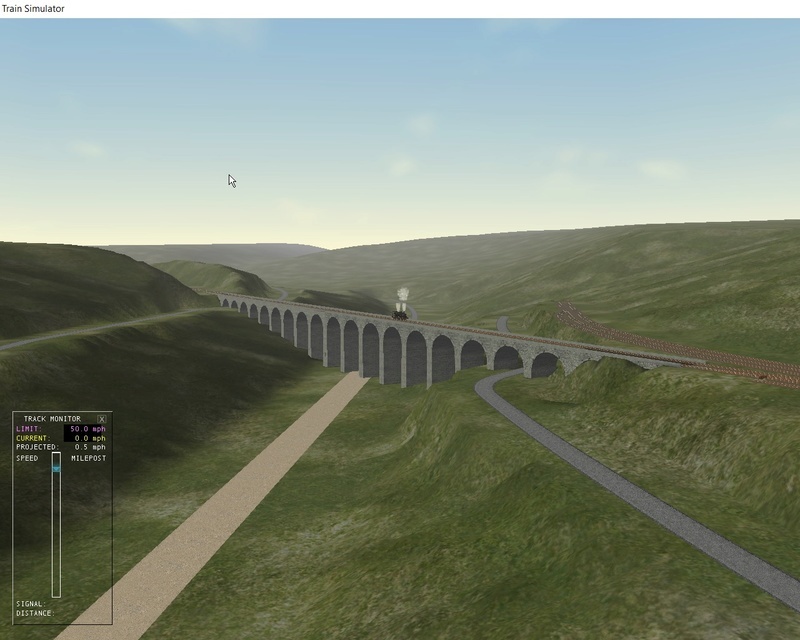 I am sure that the author of the Woodhead route (still also being extended I believe) would provide you with the viaduct just to the north of the station, as well as any bits of the station which might be useful. 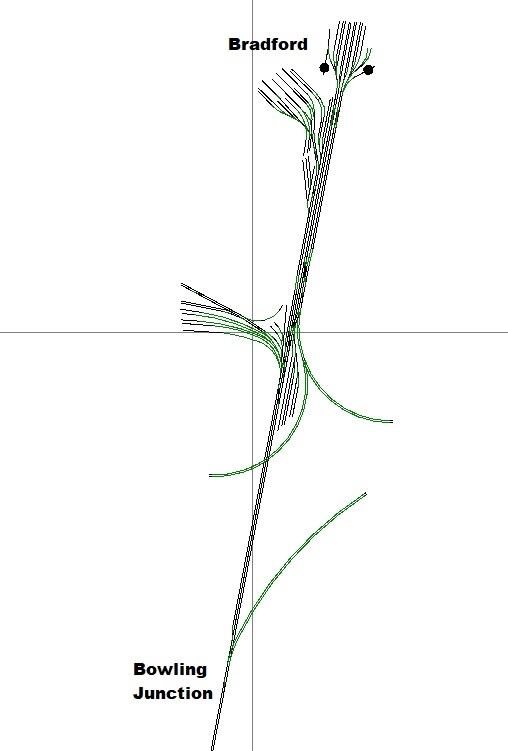 When I was laying out V3 with the Penistone line and the three branches, I did look into doing Penistone itself. However, in my original plans I had always intended to end in Cumberworth Tunnel. I decided NOT to do Penistone for several reasons - most of the track and railway infrastructure around Penistone is GCR - I do not know enough about the CGR or have interest enough in the GCR to spend many hours building a section of railway that is not core to the main part of the route, i.e. joint LNWR/LYR. Plus there was a significant shortage of 'proper' GCR buildings available to visibly differentiate the GCR areas from the LYR areas. However, the biggest hurdle, was the giant Spring Vale Yorkshire Steel and Iron Works - this sat right beside the small batch of LYR exchange sidings - the iron works tracks run 'all over the place' and the footprints of the ironworks buildings do not co-incide with any existing 3D models, so I'd have to waste enormous time trying to make a group of custom iron works buildings where I have almost NO photos to guide me. The total area and track for the steelworks is TWICE as big as the LYR/GCR area and tracks combined. Even the steelworks 'footprint' from the 1903 OS maps was big enough, but by the 1929 OS maps the steelworks had DOUBLED in size. The steelworks could almost make a whole route just on its own !!! The steelworks was closed and demolished in 1930. You simply can't model Penistone in 1920 without the giant ironworks, it is far too PROMINENT, and for me that was a 'hurdle too far'. Thanks for the explanation. The author of the Woodhead route has not included anything in the way of industry around Penistone - perhaps because he was as intimidated by the extent as you. I have just looked at a 1960 map of the area (National Library of Scotland maps) and see what you mean. Looking on Google Earth there is of course now no railway except the line from Manchester through Penistone and north up the LYR, not much to indicate industry except the name Springvale but still quite a large station building on the west side of the line but aligned with the Woodhead route rather than the current line. And far more houses than even in 1960. So yes, your decision was right. For those who might be interested the Spring Vale Yorkshire Steel and Iron Works was later owned by Cammell-Laird before they became David Brown. And ... you can see why the steelworks DOMINATED Penistone up until its demolition in 1930. 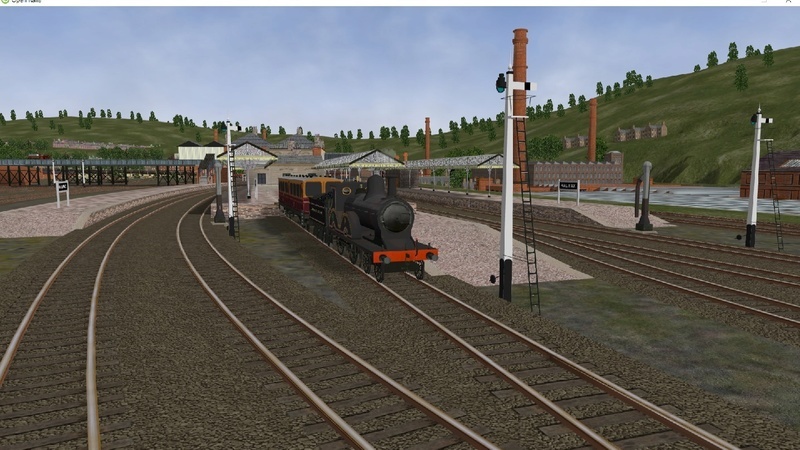 Most people don't realism that Penistone had a giant steelworks because it was all GONE by 1930, without trace, and as for the Woodhead route, that is set in the 60's, so absolutely no heavy industry in Penistone by then ! In a perverse way, I like the interesting layout with the 'dive-under' between the two sides of the works. I might even have a crack at that at some time in the future (but my forward workload is still over several years yet !) - after all, I did do a pretty full work-up of the giant Port Kembla steelworks (4 blast furnaces) at mid-1950's in my Main Illawarra V3 route. But as I lived nearby in the 50's and had heaps of information, including a site visit to the steelworks (albeit in 2008, when it was quite different), I had sufficient info to build it, but even then, there was around 4 months modelling time just on all the Port Kembla industrial scenes. 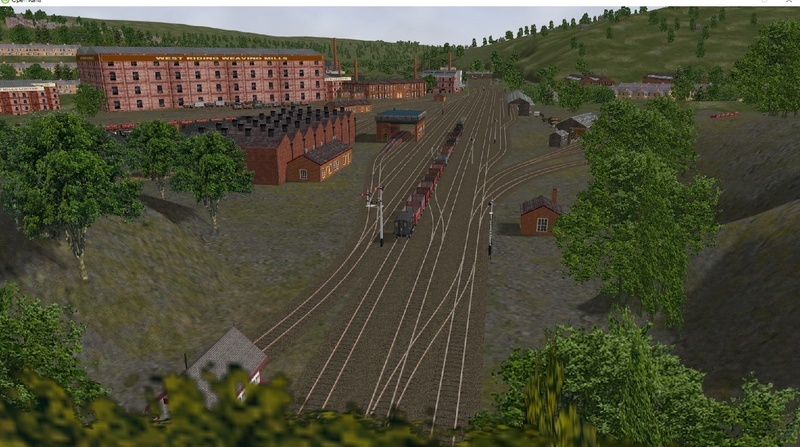 Here's a an overall view of Halifax Old station at the northern end of the narrow valley - the goods yard is behind the camera to the left hand side. And ... here's a closer view with the LYR Directors Saloon sitting in the Stainland Branch bay at Halifax Old station. More to come .... the release is getting closer. Great pictures and great news. LYR Manchester Semi-fast stops in Sowerby Bridge Up platform. Another train of coal empties passes through Sowerby Bridge to the Barnsley coalfields. It's getting closer, only the line from Low Moor down to Bradford Exchange to finish. You have really spoilt us! LYR Goods leaving Bradford Bridge Street goods yard - Bradford Exchange station in right background. Bradford Exchange looking from LYR Platform 5 towards Bowling Tunnel. These will be the last screenies before release. The route is currently out with my beta testers for final checking - release should only be a few weeks away ! This now completes the full program I had envisaged for the Huddersfield route. 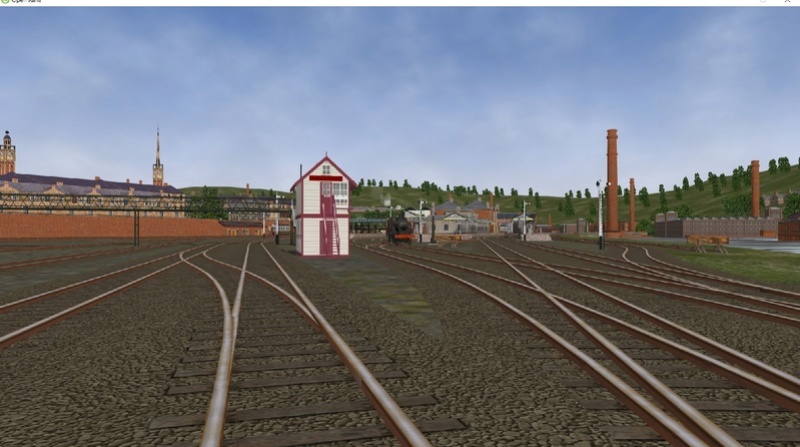 At a later stage, I am thinking in terms of releasing a modified version of this route set in LMS 1930's era. All looking excellent Brian. Looking forward to seeing the final version. The final V4 of Huddersfield and Environs - 1920 is now available for download at UKTS. I've made a start on the LMS 1930's version - this is separate from the 1920 version. Many thanks for the hard work and generosity in making this available to the MSTS community! Seconded, looks like a labour of love. I wish to advise that my original program to build up a number of routes, and associated stock, to suit the LMS pre-grouping era, of MR, LNWR and LYR has now been achieved and has come to a close. The late Pat Dalton started this, with his excellent Skipton to Carlisle 1920 - he spurred me on to do something to address the lack of LNWR and LYR routes and stock. Over the last year or two, others have built up a very comprehensive set of pre-grouping stock to work with these routes, along with a batch of excellent Activities. Thank you to all involved. There may still be, from time to time, the odd new pre-group stock item uploaded to fill in any gaps when necessary. The major pre-group companies that made up the core of the new LMS have now been given their rightful 'day in the sun'. I hope you all enjoy the results of our labours, and get many hours of pleasure with the LMS pre-group simulations. My current new program is to take the Huddersfield and Environs, and Black Country routes into the LMS era circa 1930-1935 - more to come as it unfolds. Best Regards, Brian and The Team (in no particular order - Alec Ralph, Darwin Smith, Ian Macmillan, Stephen Wells, David Forrest, Don Hinton and David Richtmeyer). I think we should take this opportunity of thanking Brian for the routes and the effort that he has put into them. It's Brian's enthusiasm that drives me to make a few more items of stock, albeit that there's probably more than enough already! Thank you Brian and the rest of the team for all your hard work!